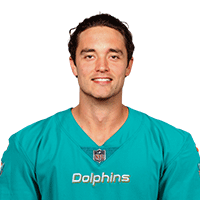 Published: Oct. 21, 2018 at 03:49 p.m.
Miami Dolphins wide receiver Danny Amendola gets his first touchdown catch as Dolphin on a 24-yard pass from Brock Osweiler. Published: Oct. 21, 2018 at 02:15 p.m. Published: Oct. 14, 2018 at 07:07 p.m.